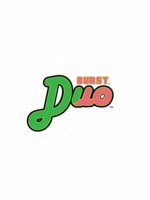 Burst DUO - Guava Dragon Fruit 60mLGuava Dragon Fruit E-Juice by Burst is the deliciously tantalizin.. Burst DUO - Peach Raspberry 60mLRipe southern peaches balanced with the sweet flavor of fresh raspbe.. Burst DUO - Kiwi Strawberry 60mLSo maybe it's true, TWO is better than ONE. By combining two of the .. Burst DUO - Apple Watermelon 60mLSo maybe it's true, TWO is better than ONE. By combining two of the..